"It's a small, but important step," said Dmitri Strukov, a professor of electrical and computer engineering. With time and further progress, the circuitry may eventually be expanded and scaled to approach something like the human brain's, which has 1015 (one quadrillion) synaptic connections. For all its errors and potential for faultiness, the human brain remains a model of computational power and efficiency for engineers like Strukov and his colleagues, Mirko Prezioso, Farnood Merrikh-Bayat, Brian Hoskins and Gina Adam. That's because the brain can accomplish certain functions in a fraction of a second what computers would require far more time and energy to perform. What are these functions? Well, you're performing some of them right now. As you read this, your brain is making countless split-second decisions about the letters and symbols you see, classifying their shapes and relative positions to each other and deriving different levels of meaning through many channels of context, in as little time as it takes you to scan over this print. Change the font, or even the orientation of the letters, and it's likely you would still be able to read this and derive the same meaning. In the researchers' demonstration, the circuit implementing the rudimentary artificial neural network was able to successfully classify three letters ("z", "v" and "n") by their images, each letter stylized in different ways or saturated with "noise". In a process similar to how we humans pick our friends out from a crowd, or find the right key from a ring of similar keys, the simple neural circuitry was able to correctly classify the simple images. "While the circuit was very small compared to practical networks, it is big enough to prove the concept of practicality," said Merrikh-Bayat. According to Gina Adam, as interest grows in the technology, so will research momentum. "And, as more solutions to the technological challenges are proposed the technology will be able to make it to the market sooner," she said. Key to this technology is the memristor (a combination of "memory" and "resistor"), an electronic component whose resistance changes depending on the direction of the flow of the electrical charge. Unlike conventional transistors, which rely on the drift and diffusion of electrons and their holes through semiconducting material, memristor operation is based on ionic movement, similar to the way human neural cells generate neural electrical signals. "The memory state is stored as a specific concentration profile of defects that can be moved back and forth within the memristor," said Strukov. The ionic memory mechanism brings several advantages over purely electron-based memories, which makes it very attractive for artificial neural network implementation, he added. "For example, many different configurations of ionic profiles result in a continuum of memory states and hence analog memory functionality," he said. "Ions are also much heavier than electrons and do not tunnel easily, which permits aggressive scaling of memristors without sacrificing analog properties." This is where analog memory trumps digital memory: In order to create the same human brain-type functionality with conventional technology, the resulting device would have to be enormous—loaded with multitudes of transistors that would require far more energy. "Classical computers will always find an ineluctable limit to efficient brain-like computation in their very architecture," said lead researcher Prezioso. "This memristor-based technology relies on a completely different way inspired by biological brain to carry on computation." Potential applications already exist for this emerging technology, such as medical imaging, the improvement of navigation systems or even for searches based on images rather than on text. The energy-efficient compact circuitry the researchers are striving to create would also go a long way toward creating the kind of high-performance computers and memory storage devices users will continue to seek long after the proliferation of digital transistors predicted by Moore's Law becomes too unwieldy for conventional electronics. "The exciting thing is that, unlike more exotic solutions, it is not difficult to imagine this technology integrated into common processing units and giving a serious boost to future computers," said Prezioso. 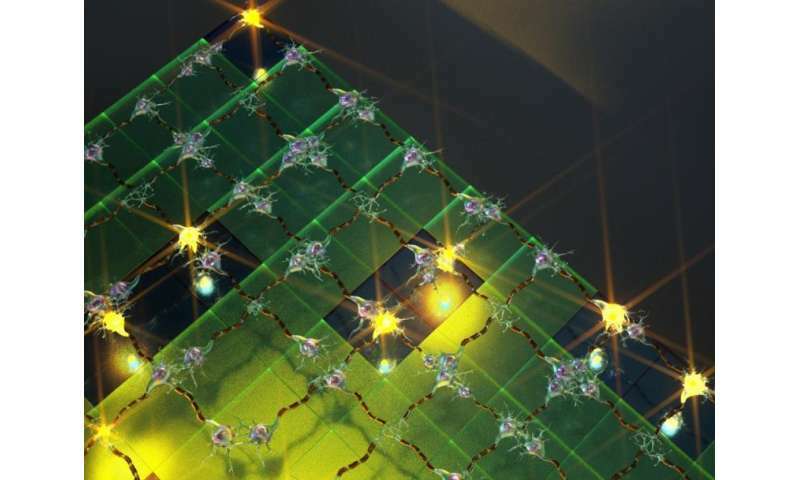 In the meantime, the researchers will continue to improve the performance of the memristors, scaling the complexity of circuits and enriching the functionality of the artificial neural network. 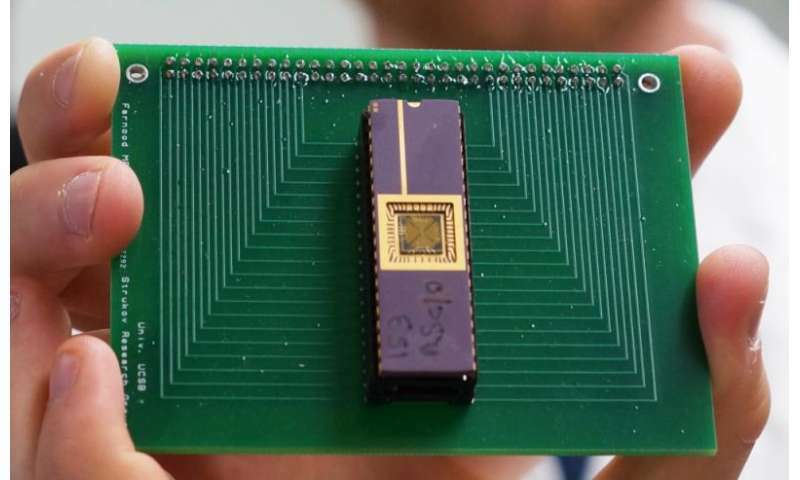 The very next step would be to integrate a memristor neural network with conventional semiconductor technology, which will enable more complex demonstrations and allow this early artificial brain to do more complicated and nuanced things. Ideally, according to materials scientist Hoskins, this brain would consist of trillions of these type of devices vertically integrated on top of each other. "There are so many potential applications—it definitely gives us a whole new way of thinking," he said. The researchers' findings are published in the journal Nature. Big step forward,but even bigger ones are needed. For one, our neuronal connections do not just go from one to another, but branch out radially, making seemingly-random connections, but those which result in memories or actions. More important, they change connections. And, we depend more on the brew of chemicals from our ductless glands witch really determine how we feel about things and tend to react to them - the "mind organs". Look into the role of those neurotransmitters in the complex we call the brain. Oops, not witch but which. How would we provide the spectrum of biasing agents for AI which drive us as emotions? Clearly, we have outgrown digital processing, and can now do it with analog or quantum processing. This is awesome! Ive read countless articles about memristor technology, and it was always in early stages and experimental. But now someone has built a functional neural network, with the ability to process and store information simultaneously. The classical computer has served us well, but this new technology will be more compatible with our way of thinking. Can a Neural network understand? Perhaps in a similar way that we can? I have to wonder if this can create true AI, it would seem logical that learning algorithms combined with advanced object recognition, at the very least we can make excellent robots. It would probably be a good idea to make them weak and slow, lol! This all needs to be sorted out by real engineers. Who do you think is working on this stuff? Amateurs? I invite you to take part in (any) first semester CS lecture. You will fail. Badly. CS incorporates a lot of math and physics (and in the specialization courses there are branches that go into medical computing where you are exposed to biology). Current CPU's act as "number filters" doing calculations based on the Code that is sent to them, and the architecture of the CPU itself, with complex circuit paths designed to calculate based on the code given to them. There is very little storage of info in a CPU, and it has to communicate with Memory and CPU cache to hold information for processing. This Neural Network, will have the ability to calculate, but to simultaneously store the info, and have many different states within the artificial neurons. This will allow higher performance, and function more like our brain. It is exciting from an AI perspective, because naturally if we can create a more close duplication of our own neural tissue than we are closer to creating something that can "think" like we do. Great Stuff! Cool, let's see it produce truly random numbers. Bet it can't because I don't think neuron means what we think it means. I keep wondering if tricks learned in creating FPGAs could help solve that problem. FPGAs are basically hardware that is constructed by software-- software determines connections between fundamental circuits to build a cpu or whatever.